Being a Tough but Tender Leader looks at the processes of dealing with conflict in churches. Most conflicts can be resolved simply by knowing when to be tough and when to be tender. H.B. London Jr writes: "What I observe is an increase of contentiousness within congregations. I have further observed an increase in forced pastoral terminations and failed assignments. I have seen an upswing in the number of Christian leaders who, because of burnout and frustration, have opted out of their calling. In many cases, this choice has not necessarily been because they wanted to make such a transition, but because they could no longer stand the pressure of a contentious laity. Too make was at stake. The leaders valued their families and their own sanity far too much to stay and jeopardize their own future. I have talked to many of these people and have felt their total frustration at the inability to work out the 'mess' that threatened their leadership." "In truth, some situations are just too tangled to correct, but from my experience and from the situations I have observed in which leaders successfully worked their way through the mine fields, I would argue that most conflicts between leaders and followers can be resolved. It is simply a matter of knowing when to be tough and when to be tender." Here are some insights to consider when balancing toughness and tenderness in your leadership. London notes, "When each of us faces conflict, our decisions are influenced by the way our parents handled their challenges and, in some cases, the ways in which we have addressed our own past disappointments." In other words, it is important to be aware of these influences. If your parents were people pleasers and avoided conflict, you may have handled most of your problems through avoidance and compromise. Being aware of these influences will help you develop new skills for handling conflict. Self - We are often our own worst enemy when it comes to conflict. Let's face it, we know our faults and short comings and when conflict comes, leaders need to first look at themselves and ask some hard questions: Am I being fair? Is pride getting in the way of a solution to this problem? Am I being stubborn? etc. etc. Criticism - We seldom enjoy criticism and often it can lead to conflict. The challenge is working out if there is any truth in the criticism. If there is, we need to accept that. Nevertheless, criticism needs to be confronted and worked through. A good question to ask our critic is: What do you think we can do to resolve our problem? Communication - Leaders can talk but do we listen!. As London observes, "We have learned well how to speak our opinions, but we have not learned how to hear or respond equally well to the opinions and positions of others." Sometimes, we just need to agree to disagreed. Staff - Conflict with staff needs to confronted and dealt with, otherwise morale will suffer. If a staff member is no longer supportive or loyal to his leader, then he should leave. Change - Change always costs something. People either resist change or want change and conflict usually comes when leaders make a choice that either leads to change or that choice maintains the status quo. Sometimes, leaders just need to count the cost of change and get on with the job. Expectations - London writes, "In the overload frame of mind, a pastor often gives up on a fruitful devotional life and a robust, satisfying family life. As a consequence, many wrestle with empty souls and a loss of family through divorce or rebellious children." In other words, don't let your assignment determine your lifestyle. Why is conflict so prevalent? It is often the result of immaturity, self-centeredness and pride. Sometimes the leader himself becomes the target of derision and must show a tough side. If conflict is not resolved, the church will be unable to continue any level of effectiveness. To allow conflict to become a habit is to shirk your responsibility as a leader. 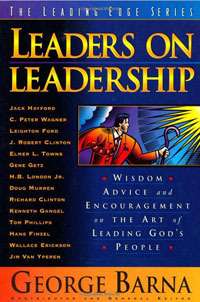 London writes, "I think one of the great challenges for many to today's pastors is to exert firm leadership. Most of us come into the pastorate having tender hearts, and desire to demonstrate servantlike love and mercy. The church, however, is a spiritual battlefield and it often requires a strength of leadership that is uncommon in the secular world." Leaders often say that conflict in ministry is a given; however, this does not mean it needs to go unmanaged. London suggests four steps for conflict resolution: 1) Identify the point of understanding, 2) Make reconciliation the primary objective, 3) reestablish oneness of heart, and 4) accept one another for who we are. These steps may not always lead to agreement or understanding on every issue, but it might result in bring people back together. London writes, "When a person is 'leadership tough,' he needs to perform his leadership duties as a winner. When we view our problems in leadership as a win/lose proposition, it creates exactly that - winners and losers. Tender leadership attacks conflict with a win-win attitude. It wants to come out of the fray with as few scars and hurt feelings as possible." Always accept personal responsibility for the situation. It may or may not be my fault, but a true leader must take the initiative for reconciliation. Make any effort necessary to move toward the person or persons involved in the conflict. I can play the 'blame game,' but it will not do any good. As leader I must make strategic use of my limited leadership resources. In those calculations must be a determination to use some of my leadership capital to control conflict-oriented circumstances. Take the risk of confronting the issue for the sake of the relationship. In the end it will make little difference who wins or who is right, but what really matters is how we walk away from one another. To read this article by the original author, click on the following link Being A Tough But Tender Leader.